ONE THIRD OF THE BIBLE IS PROPHESY. That prophesy tells us who the anti-christ will be (is) as laid out in my two books. “He replied, “Go your way, Daniel, because the words are rolled up and sealed until the time of the end. 10 Many will be purified, made spotless and refined, but the wicked will continue to be wicked. None of the wicked will understand, but those who are wise will understand. 11 “From the time that the daily sacrifice is abolished and the abomination that causes desolation is set up, there will be 1,290 days.12 Blessed is the one who waits for and reaches the end of the 1,335 days. This also solves to 688 CE. JESUS, DANIEL AND JOHN, in unison, precisely and with specificity, correlate to 688 CE. Enclyclopaedia Britannica tells us in 688 CE the temple site was cleared of ruble to make way for the “Dome of the Rock” sitting in the outer court (court of the Gentiles) where Revelation tells us, also where Daniel tells us and where Jesus told us. THAT IS ANTI-CHRIST! So the pontif, and many others, Rick Warren (Chirslam) are deceived and deceiving the world claiming the God of Israel (Father, Son and Holy Spirit) is the same as the god of islam. Or that light can accept and have approving fellowship with darkness. The false prophet (dressed in purple and scarlet and glittering with gold) causes the world to believe in the beast as per Revelation setting up a one world religion and a one world government and financial system dedicated to anti-christ also coming. Revelation 13; 17; 18. The beast described in Revelation (actual prophesy … Isaiah 41 and 46 … God alone tells the end from the beginning … as YOU PEOPLE SAW HIM DO!) is the one these others await. They claim Jesus (mere prophet) will assist their Mahdi in destroying Satan when he descends on the Mount of Olives. BASS-CRACK-ACK-WARDS! Alter-Prophesy … Anti-Prophesy conversely made up in the 8th Century alter-inspiration alter-copied from Revelation to deceive the world. Jesus is God Almighty and no other path leads to eternal life. Chris Queen. The genuine article. Not a camouflaged sheep. I’m Josey Wales. Please hit the Follow Key above and to the right for future updates. Please leave me your valued comments in the form below and find further blog posts there. 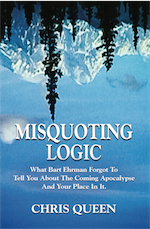 Read my books Misquoting Calculus HERE and Misquoting Calculus HERE, if you want to know the truth and salvation in Jesus who has unsealed the scrolls of Daniel. John 3: 3: “Jesus replied, “Very truly I tell you, no one can see the kingdom of God unless they are born again.” (NIV) That is my aim.